Days may be getting shorter, but there’s still plenty of time to get outside and enjoy the beautiful Pacific Northwest fall weather. I don’t know about you, but I find the cool, crisp air and saturated colors at this time of year so invigorating. It is the perfect time to hop on two wheels and go for a ride. 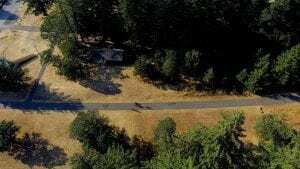 While there are literally hundreds of trails throughout the South Sound area, there are few that offer paved routes traversing forests, wetlands, and other agricultural gems. Thurston County is home to the 14-mile Yelm-Tenino Trail. 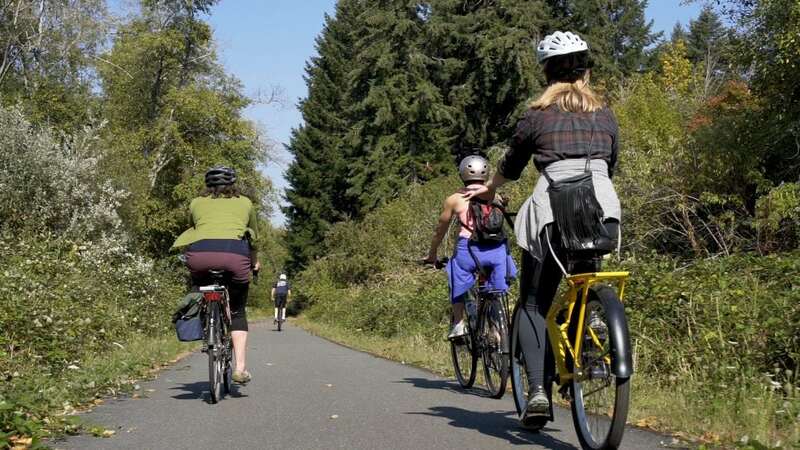 While not as well-known as its sister trail, the Chehalis-Western, the trail connects the rural cities of Yelm, Rainier, and Tenino. Just over a 100 years ago, it was known as the “Prairie Line” by the Burlington Northern Railroad. 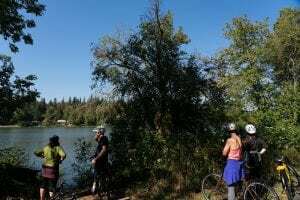 Now the well-maintained trail offers recreational users a unique and decidedly different way to access Thurston’s Bountiful Byway and experience some of the county’s best kept secrets. Whether you are looking for a day out with the family or something a bit different for your next date, grab a bike and turn your ride into the destination. With the Yelm-Tenino Trail, you can customize your experience based on the time (and energy) you have. Whether you take the whole day and travel 28 miles round trip, or take a more leisurely journey, Experience Olympia & Beyond has recommendations to help you think beyond the trail. For a romantic day you won’t soon forget, head over to the Yellow Bicycle Project in Tenino, located at 213 Sussex Avenue W, to borrow a free bike (don’t forget your water and a helmet). 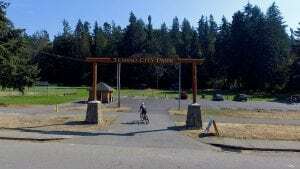 You’ll find parking and restrooms at the trailhead located at the Tenino City Park on Washington Avenue. If you go on a Saturday between May and September, you can stop by the Tenino Farmer’s Market between 10:00 a.m. and 3:00 p.m. to pick up snacks for your trip. 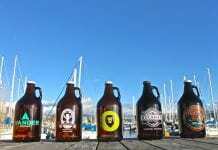 Once you reach Yelm, it’s time to rest and rehydrate before your return trip. Take a leisurely stroll or have a picnic at Cochrane Memorial Park and then continue to Uptown Lounge for a refreshing beverage. Or if you prefer a longer rest, maybe catch a movie at Yelm Cinemas. 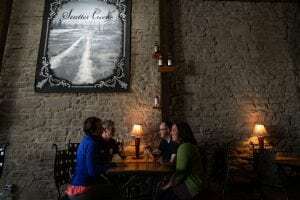 Once you’ve made your way back to Tenino, return your yellow bike and end your lovely day with a visit to the Scatter Creek Winery & Brewery. Start your family fun day by parking at the Yelm trailhead located behind the City Hall. Get prepared for your ride by taking advantage of the picnic tables (no one wants hungry kids!) and restrooms. You can even learn about the trail at the information kiosk. And if you go on Saturdays from May through October, you can make a stop at the Yelm Farmer’s Market between 10:00 a.m. and 3:00 p.m. to stock up on fresh snacks. No matter how you decide to spend your time on the Yelm-Tenino Trail, you are sure to create a unique and unforgettable experience. So, go ahead and make plans for your decidedly different day exploring the bountiful byway by bicycle. Experience Olympia & Beyond has great tips to help you plan this escape and more. Learn more on the Experience Olympia & Beyond website or give them a call at 360-704-7544.